Custom Implant Abutments creates natural looking emergence through a process of precision milling of margin contours, which results in ideal soft tissue and crown esthetics. The final implant restoration also promotes gingival health, while exhibiting a natural ceramic result. Protect remaining natural teeth — With conventional bridgework, the teeth surrounding the missing tooth must be ground down. Dental implants often eliminate the need to modify these teeth, resulting in a conservative, esthetic restoration. Improve appearance — When teeth are lost, ongoing shrinkage of the jawbone occurs. This process makes the face look older. However, implants have proven to slow down or stop this process while still exhibiting the look and feel of natural teeth. Improve speech — Fixed replacement teeth allow you to speak with more confidence in a relaxed and natural tone. “UCLA” abutment is an example of this type abutment. D6060 -Abutment supported porcelain fused to metal crown (predominantly base metal) – A single metal-ceramic crown restoration that is retained, supported and stabilized by an abutment on an implant; may screw retained or cemented. D6061 – Abutment supported porcelain fused to metal crown (noble metal) – A single metal-ceramic crown restoration that is retained, supported and stabilized by an abutment on an implant; may be screw retained or cemented. D6062 – Abutment supported cast metal crown (high noble metal) – A single cast metal crown restoration that is retained, supported and stabilized by an abutment on an implant; may be screw retained or cemented. D6063 – Abutment supported cast metal crown (predominantly base metal) – A single cast metal crown restoration that is retained, supported, and stabilized by an abutment on an implant; may be screw retained or cemented. 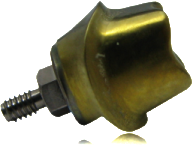 D6064 – Abutment supported cast metal crown (noble metal) – A single cast metal crown restoration that is retained, supported, and stabilized by an abutment on an implant; may be screw retained or cemented. D6065 – Implant supported porcelain/ceramic crown – A single crown restoration that is retained, supported, and stabilized by an implant; may be screw retained or cemented. D6066 – Implant supported porcelain fused to metal crown (titanium, titanium alloy, high noble metal) – A single metal-ceramic crown restoration that is retained,supported, and stabilized by an implant; may be screw retained or cemented. D6067 – Implant supported metal crown (titanium, titanium alloy, high noble metal) – A single cast metal crown restoration that is retained, supported and stabilized by an abutment on an implant; may be screw retained or cemented.